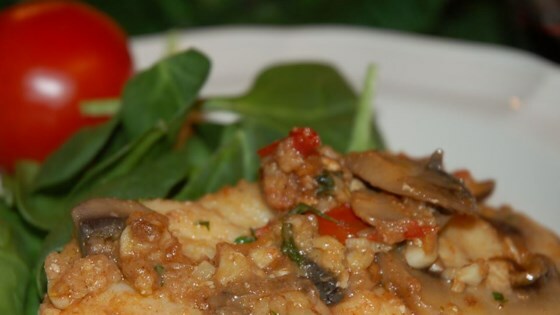 "A great recipe for monkfish or tilapia with garlic, tomatoes, mushrooms, and white wine. This is one of my mother's favorite recipes! Serve over pasta or rice." In a resealable plastic bag, mix the salt, pepper, Cajun seasoning, and flour. Place the monkfish in the bag, seal, and shake to lightly coat. Heat the oil and melt the butter in a skillet over medium heat. Place the monkfish in the skillet, and cook for about 3 minutes. Mix in the garlic, tomato, and mushrooms, and continue cooking 3 minutes. Mix in the wine and parsley. Continue to cook and stir 2 minutes, or until the monkfish flakes easily with a fork. A very good basic recipe for creating an 'ala provincial' dish. But I seasoned the flour, and added a bit more of white wine and garlic. It turned out terrific! OUTSTANDING! This is a delicious fish and very yummy way to serve it. Thanks!